I have discovered quit a few ugly ships till now and I guess a lot will follow but it hasn’t happened to me before that I found 3 ugly ships in less than 1 hour all (once) belonging to the same shipowner. So that’s why I’m doing this ultra-special triple-post! Converted : 1973 to a live-stock carrier. She has sunk in 1980 after an engineroom fire, resulting in the loss of 40.000 sheep and 1 crewmember. Converted 1976 to a live-stock carrier. I haven’t found whether she is still afloat or not. This one is scrapped, already in 1997. These 3 vessels are named after the immediate family of mr. Raschid Fares: his wife Farid Fares and his 2 kids: Fernanda & Danny. Pretty & honorable names for such ugly vessels. A converted carcarrier: still not mothers finest but better looking than the other 3 monstrosities. Hi I am helping my Dad Captain george Barry research some material as hehis writing a book about his life as a merchant navy Captain. I laughed when i discovered your ugly ships site. He was in Fact Captain of the Danny F , Danny F II and the Fernanda F which i also accompanied him on on one of his trips. Unfortunately pictures do not capture the sheer size of these vessels and from memory Dad told me the Danny F II was the largest livestock carrier in the world. Whilst it looks a bit like its seen its day, it was in fact highly computerised and modern internally. The company owner Mr Farres a dear friend of my Fathers. Glad you like the site, please do some back for more chuckles! Good Luck to you and your father with writing the book. Please let me know when the book is finished: I would like to read it. Unfortunately your shot of Don Carlos ‘before conversion’ to Danny F II is the wrong Don Carlos !! You have shown the 1997 built one not the 1976 one. The old one was converted in 1994. Aaai…how could I have missed that???? The difference is pretty obvious! I’ll rectify it immediately….thnx for bringing it to my attention! I am looking to get in touch with him as he is my boyfriend’s godfather. I have just stumbled accross this site. I have had the honour to sail with your Father many times, but have lost touch. Ugly, as in beauty, is in the eye of the beholder. Danny F II, and Rodolfo Mata I have never thought of these ships as being ugly. Certainly challenging to run and maintain, but this was done in a very professional mannner by all involved, with the welfare of the annimals being the first priority. Please extend my best regards to your Father. If you would like to get in touch my email address is petercolemanwilson@btinternet.com. I have forwarded your message to Patricia by email, hopefully this way she will see it earlier. Danny F II is still trading sucessfully. Mr Rachid Fares was un-married,the Danny F and Danny F11 were named after his nephew Danny Faqhar,now the head of the company and the Fernanda F after (I think) his sister.The present Rudolfo Mata was named after the managing director of the company in Australia and I believe it is the largest livestock carrier in the world. I agree the ships were not very glamorous in appearance,but in fact the were strictly regulated and very well run,the welfare of the animals being paramount. I sailed on the Fernanda F, Danny F & Persia, more than once with Capt Barry, hope all is well with you in retirement George. Good times & memories from the 80’s. is it true that Danny F II had a problem on the way to Montevideo? 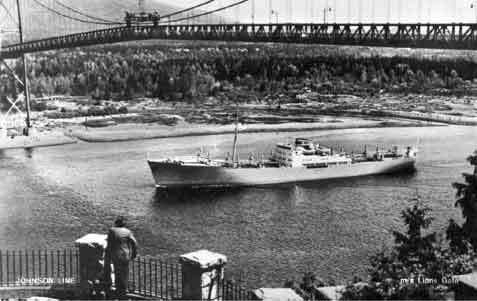 The first ship was Al Fares (ex general Carreras, Chilean flag), it was a catle carrier, modified in Buenos Aires to transport sheeps, from Constanza to Trabsum (Turkey), and by road to Iran. Second ship was Farid F, included in your list, converted first in Buenos Aires, capacity increased in Singapore 1976. The engine room fire probably caused by a broken fuel pipe spraying on some hot surface,(according to statement of the Engineer on duty ). Third ship was Persia, ex Europa, Lloyd Triestino Italy. Converted in Buenos Aires, to carry 48,000 sheeps, scraped in Pakistan. Fourth ship was Cyrus, it was a Norwegian ferrie, converted in Buenos Aires in 1976, to trade between Constanza and Trabsum. 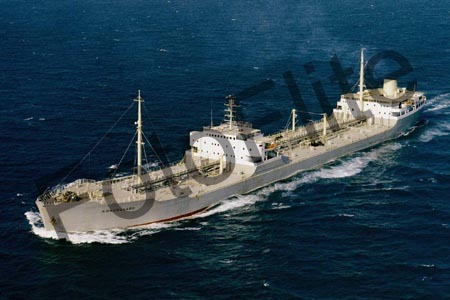 Fith ship, Danny F, ex Tinfond, tanker,Ex “Atlas Pioneer”(Sheep carrier) capacity 55,000 heads, purchased by R.F. in 1977, later it was shortened from 230 metre length to 170 metre, at Mitsubishi SY, in 1978 the capacity was incresed to carry 130,000 sheep. Later came Fernanda F, ex tanker, converted to live stock carrier by the owners prior to RFE ownership. Danny F II, Converted at Pan united SY Singapore. 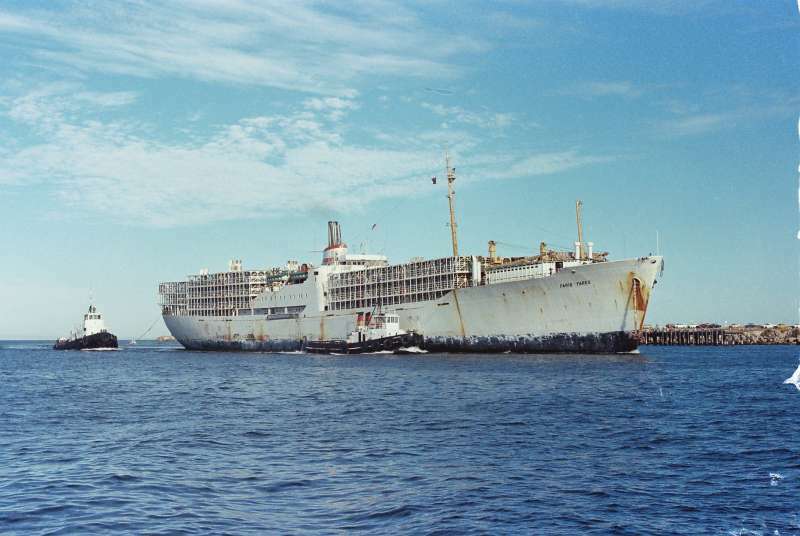 Farid Fares, was a cargo ship, converted at Constanza, Rumania exclusively for cattle. The vessel “Danny F II” has gone down off Lebanon this afternoon. The coastguard authorities have been informed and at the time of writing I have no further news. sad news for all – Danny F II had totally gone . Someone give more detailed information about this tragedy! Someone working there from relatives? Does anybody know if Samer was on board the Danny F11 that just went down off Lebannon? captain John Molloy,he relieved me at the end of my last voyage on the Danny F11 before retirement,in the few days that I worked with him he showed himself to be very kind and considerate,a perfect gentleman. The carriage of Livestock from Monte Video to the Med has always been a problem,it is a long voyage and the animals are consuming ballast water and Fodder from the lowest Tanks and depositing it as dung on the uppermost decks,thus making the ship more and more unstable. I actualy did the same voyage on the Danny F11 and was very very concerned about the vessel’s stability at the end of the trip. 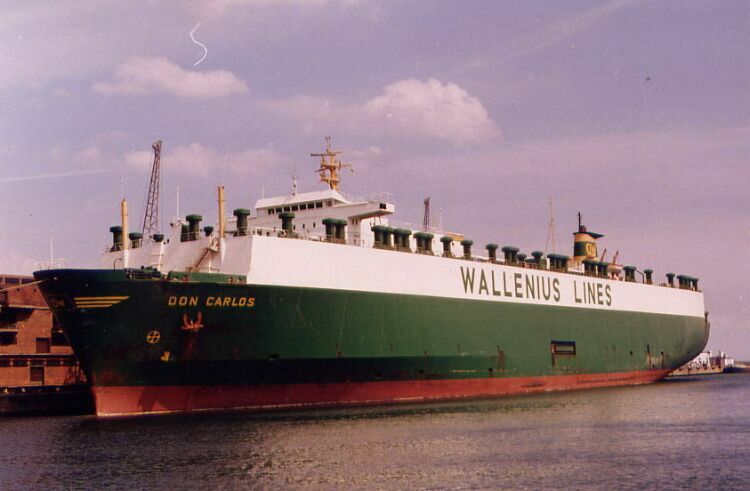 I sailed on the Danny F11 on its maiden voyage as a livestock carrier from Fremantle, Australia to Muscat, then onto further ports in the gulf region in 1995 (approx). The Captain was Peter Phillips, Chief Officer was Lindsay Milne. I travelled on the Danny for 5 or 6 voyages, also the Farid F & Fernanda F, some with George Barry. What a good master. Hi Geo. What part of the world are you in atm? just for the record guys , the dany f11 sank 4 days ago, here in lebanon , carrying 80 000 cow, some of it s 83 members died ( 6 persons including the captain) and 39 were saved and the rest disapeared . This a very sad moment with the loss of DannyF11. started.And I hope it continues. Regards and sympathy to all. My thoughts and prayers to all on board and their family. Many years ago i sailed on the Danny for Fares as a stocky. If the Australian is who i think it is my sympathy to the family. he was a great bloke and a hell of a cattle man. if things have not changed since I was in the Gulf and Indian Ocean, finding the livestock ships is not a problem just follow your nose! you could smell them tens of miles away. Worked with a Navy P-3 Orion who claimed they could smell them in the airplane! There was some conversation about them either spotting for or being a base ship for the raiding boats during the Iran/Iraq war in the 80’s but that was shouted down as no one being able to stand the stench. The two times we ever saw them in port they always had fire hoses sluicing out the cage decks and the water around them reeked! Thanks for the info you provided regards DannyF11. there isnt a ship this big anywhere. onboard, which I think would be closer to the right number. parts of Rachid Fares and Captain Amata operation. If there was an Australian Stockman lost on the Danny F11 I would like to know his name,I sailed with many of them and held them in the highest regard. I have just returned home today after a brief tenure on another vessel which I was on when my Wife telephoned last Friday informing me of the Danny F II tragedy. First and foremost I offer my heartfelt condolences to the bereaved families of my Shipmates and a speedy recovery to those who were saved. Since 1996 I have had many tenures on the Danny FII as Chief Engineer and since my retirement in 2008 I have still been involved on several occasions. Infact I had agreed to relieve the Chief Engineer for a while on the Vessel’s next return to Montevideo, so He could have a spell of leave. Tragedies of this nature are bound to bring out mixed feelings in people some of which unfortunately are like those of Fooman. As far as I am concerned the important thing to put on record is the diligent and harmonious manner in which the multi-national Officers and Crew conducted thier duties under the exemplary command of my best friend the Master. will appreciate this very special Vessel. So out of respect for those who perished on this iconic Vessel no more inane comments please. Perhaps the lebanese authorities or the red cross hold the crewlist of Danny F II. Maybe there you will get an answer. A few words if I may? I had the privilege to work alongside, (over a six year period) the likes of Captain. George Barry, Captain. John Milloy, Chief Engineer, Peter Coleman-Wilson & Chief Officer Lindsay Milne & Head Stockman Gary Beckett, to name but a few, in addition to the the numerous Pakistani & Filipino nationals who worked as a dedicated team to ensure the utmost care & attention was had for the thousands of animals transported over the years. I have been wondering how to contact you. Please get in touch. My email is as above. With the info you have given I guess you are Mr Raul C.
Please contact me on the e-mail given above. I am proud to be the sister of John Milloy, Master of the Danny F2 which capsized on 17th Dec. Many lives have been lost including that of my brother but thankfully his body has been found.God bless all families whose loved ones remain missing. My brother was a very experienced sailor and had been in the Merchant Navy for more than 30 years.He thought highly of his crew. Thank You George, Peter and Mark for your kind words which are much appreciated at this devastating time. As for Fooman, I find your comments offensive and you should be ashamed of yourself. You are obviously a very nasty person with a sad life. The disaster with the Danny FII is a great tragedy and I’m very sorry for your loss. I’d like to express my condolences to you, your family and to all of those close to Captain Milloy. Of course my condolences are also for all the relatives of the other crew perished during the sinking. I hope you all find strength to overcome this terrible loss. I was full of mixed feelings. To all the family of the crew on the the Danny FII my deepest sympathy goes out to you all at such a tragic time. The news of the 18th came as a shock and I still haven’t come fully to terms with it . I found this site purely by chance. A lot of the nationality’s I met became good friends. Peter Wilson and George Barry Good to read your posts. Garry & John and the crew I cant put into words my feelings of sadness except to say you are and will always be in my thoughts. George my dearest friend it is good to read your post. My Dad was also the Captain of the Danny F 2 but sadly he was the last 1 to be captain of the Danny F 2. He was a great and nobel Captain and was loved by all his crew. He is greatly emembered by everyone in his small town in Campbeltown, Argyll. He left me, my wee brother and my mum (his wife). To old friends and with sencere thoughts to the family of all those lost. I started work with the Fares Group about 2000 around the same time as Captain John Milloy. We both had just been made redundent by P&O Bulk Shipping, friends had told us about available jobs, luckly I retained my rank as Chief Eng. John had to go back to sailing Mate. John was soon promoted to Captain and we sailed for a short spell together on the Danny F II between Freo and Port Headland then on to Dampier. Having sailed together several times in P&O we were both so happy finding our feet in a new Company which was small enough to have a personal touch. The help that was given to us was so friendly in the first instance real seafarers and they new their ships. John Milloy was a good personal friend I would have sailed anywhere with him we spent many a time sharing a beer and solving the troubles of ships and world problems. There are so many other men lost but I must make a special tribute to Big Garry the stocky I remember being with him the day 9/11 took place he was a man with great moral valves, the wee second engineer Manual Calor (Manny) such a loyal person. Having been in touch with friends from the past everyone speaks so highly of John these tributes I will redeliver to John’s Family. I hope every assistance is being given to those lost that are not yet found my thoughts will remain with them always. otherwise known as Big Willie the chief. This week, there have been funeral notices for Gary Douglas BECKETT, in the Queensland newspaper The Courier Mail. My curiousity arose because I once lived on Bribie Island, which must have been Gary’s home port. The following is my summary of the details from Gary’s funeral notice. Gary Douglas BECKETT, late of Banksia Beach. (Then mentioni of his family members). Gary was greatly respected by his family, those who knew him throughout Australia and his international family associated with the MV Danny FII. Gary’s funeral to be held at 10.30am at John Power Stand, Eagle Farm Racecourse, Brisbane. (Austrlaia). I hope it is appropriate for me to submit these details. It is so sad to hear of the tragedy which has affected to many loved ones of the crew. I participated in the SAR-operation for MV Danny F II in this terrible night. I would like to express my deepest sympathy for all which suffered from the loss of their beloved relatives and friends. I am so sorry that we could not find all crew members in this stormy night and the days after. But please be sure, that we did our best to search and safe everyone of the crew. I was deeply saddened to hear about the death of the crews of Danny F 11, I know how difficult this must be for their families and frinds. You are all in our thoughts and prayers. I am a Syrian Citizen and we lost few Syrian crew men onboard the vessel, one of them is samer who posted a comment on this forum (please see above his post) on 10 November, 2009 at 12:36 -I regret to advise that Samer was onboard the vessel on the time of incident and he is still missing. Local agencies are currently searching for him on the shore of Syria and Lebanon. I am Gary Beckett’s daughter, it is lovely to hear you all speak of Dad so kindly. This is a horrible tragedy for our family, Dad was a brilliant man who is dearly loved by many. I offer my deepest sympathy to Captain John Milloy’s family, he was a wonderfull man and a dear friend to my husband Greg and I and my mother Ros (Gary’s wife). We were all fortunate enough to have worked on the Danny F with John as our Captain. My heart aches for the crew Dad cared for so much, I met with the survivors in Tripoli. They endured so much in the battle to save their own lives and where utterly devastated by the loss of their friends. Some of the surviors where still looking for brothers, uncles,cousins etc. They spoke of Gary and John in such high regard. I should take this opportunity to show my appreciation to the Australian Embassy’s in Lebanon and Egypt and the Canadian Embassy in Syria. Their help in the search and eventual repatriation of Dad was truly outstanding, we could have never have done it without them. I did a single voyage with Gary on the Danny F II from Australia to Egypt in 2000, but that was enough to entrench him in my memory as an exceptionally decent, hard-working and good-natured man. Gary’s efforts to ensure the welfare of his very large livestock cargo were really outstanding, and the trip report from that voyage consequently recorded that the remarkable lack of sickness and death amongst the livestock could largely be attributed to Gary’s efforts as Head Stockman. Others that I have spoken to since the tragic sinking of the Danny FII have similarly fond memories of Gary. He was a pleasure to work with, and was universally held in the highest regard as a stockman. I offer my sincere condolences to you and your family, and to the families of those others lost on the Danny FII. all my prayers and symphaty goes to you. I wish you get throught these difficult times in the best possible way. I would also like to inquire if any of you knew one of the older RFE captain Mr. Nikola Spero? my brother (CRUZ) is one of the missing crew of dannyf11. we’re still waiting for any updates here in the philippines. what shall we do after this tragedy? any comments & advice. thanks. Dante, please feel free to contact me by email tiz.baker@bigpond.com, i would love to be able to help find your brother. I feel your pain and my thoughts are with you. Having worked closely with the Fares Group for over 20 years a tremendous relationship was formed with so many fellow workers. I still have a feeling of disbelief that The Danny so tragically sank with many of my friends. To you Kathleen,(we sailed from Portland to Mexico) words cannot describe my grief to learn only today, via this site that Gary your dad was lost. Of all those I sailed with, Gary Beckett was held in the highest esteem both as a man & as a stockman who had a natural instinct to provide the best care for the animals he so capably cared for.He will be sadly missed by all who had the good fortune to know him. Captain John Milloy was exactly as others on this forum have described and I find it very difficult to believe that this tragedy has taken him also.My heartfelt condolences to his family for such a sudden unexpected loss when words are hard to find to express my feelings. To the families of others lost, many of whom I no doubt worked with, you have my deepest sympathy. The work ethic of all those who were employed in the industry deserve to be held in the highest regard. You were inquiring about Captain Nikola Spero. He was a highly respected captain who was based mainly in the Fares office in Constansa & sailed mostly in charge of the Cyrus & Al Fares.He also sailed Mr Fares yacht the Alma which sank while he was on board. (he survived). Captain Spero unfortunately died over 10 years ago.He was wheel chair bound for a couple of years,after falling from a ladder while attending to maintenance on Mr Fares property a Mallards. As this is the only way I feel I am able to contact you, I wish you George a happy retirement & would love to read your book. To you Chopper , Hi, I wish you well,and Peter ( chief) all the best. my deepest sympathy to all families, my boyfriend Nicolas, traveling by boat when the trajedias and thank God we have it here, we always spoke well of everyone and the great people who were the Captain John Milloy and Garry, we also told he could talk to his daughter Kathleen, that’s to name but a few people, all here we’re sorry, we had an excellent picture of them was very sad to know that they are no longer, through this site I want to convey my prayers are also for their families and all the crew. Jim Kerr, thank for your lovely post, your words are very true, dad spoke of the voyage he did with you, he held you in very high regard.I appreciate your post and thank you on behalf of my family. Neil, so nice to hear from you, I was wondering how i could contact you, thank you for your kind words, the time I spent working with yourself and Dad was a wonderfull experience and I treasure it deeply.I hope to one day catch up, i hope you are well and thank you again. Chopper, thanks so much, I have sent an email to your hotmail address, hope it reaches you well. I first sailed with Garry in the summer of 1999-2000. I think it was his first voyage as head stockman. We then completed many voyages together over the next few years. Just found out yesterday about the sinking of the Danny and the tragic loss of Garry, John, Lindsay and so many others. Deepest sympathy to Ros, Kathleen, Greg and all family and friends of those who died. Garry was always larger than life – both in stature and in character. A great stockman and man, who always lead by example. RIP. my e-mail .. lucia_rava@hotmail.com .. Shocked to hear, DANNY FII LOST, I just left ship last voyage handing over VTCTOR, also don,t know the fate of my Filiplno engine staff. Capt. Malloy who was my very kind neighbour on ship always speak high about PETER WILSON COLMAN DURING PARTIES. I remember Gary , Uruguay and Pakistani/all crew especially Sardar, 2nnd Tindall and feel very sorry about the incident. My brother Alan Atkinson was an ETO on the vessel and has either not been found or not identified. There is confusion on how many are still missing. There has been little information and no survivor accounts. I would like to know more about the ship and would appreciate seeing photographs. Apologies for my lack of correspondence recently but as everyone is aware it has been a very difficult time. John’s body was returned home on 31st Dec and he was buried in Campbeltown, Argyll on 5th January. Kathleen thank you for your kind words and on behalf of my Mum, brother and I please accept our sincere condolences on the loss of you Dad. Our thoughts are also with your Mum at this distressing time. Martin, I am so sorry to hear that your brother Alan has yet to be found and can only imagine the unbearable stress your family have been suffering over the past several weeks. Like yourself, we have recieved very little information. Someone must know the correct figures regarding how many people survived; remain missing or have died in this horrific tragedy. It is about time all families concerned are treated with respect and kept up to date with current information……..afterall, surely we are owed this! There is also a letter on page 16 of the Telegraph highlighting the lack of coverage by the British media regarding this tragedy. I too have written to the BBC asking why such a disaster was not highlighted but I have yet to recieve a reply. I did three voyages as NZ Govt vet on the Danny F (1) in the mid-90’s with Captain Peter Phillips and First Officers Lindsay Milne and (Lindsay?)Hogg. A great experience with fine officers and crew running an old ship on the edge. Anxious memories as a landlubber watching my bathwater lurch slowly from side to side towards the end of the voyage as the feed ballast was transferred to the upper decks as dung. My regards and condolences to all those who have lost loved ones with The Danny F 11. Once again, my deepest condolances to all the families of lost crew. I have been asked today to post this message from M.V. Nada presently at a shipyard in Tuzla, Turkey. (Which I have just left today). The incident of the Danny F II took too many people from us far away. 30 Pakistanis some Filipinos, but the great of all our beloved Captain John. We are in great grief as are you. Captain John was not just a Captain for us he was a great friend and brother to us. Although we are not with you our thoughts are with you all. After the sad news we were in shock that a great friend of us had left the world. Please accept all our condolences. Tindal Badri Munir, 2nd Tindal Hamidullah, and All Pakistani Crew. May rest His soul in peace. In answer to your query re Capt. Spero, Due to the closure of the Constansa office & the Al Fares coming to Australia, there was little for Capt Spero to do.Being a highly respected member of the Fares Group, Mr Fares looked after Capt Spero as best he could, & among other Co. duties, one was no doubt helping out at Mallards. I hope that everyone else that survived is ok and making a good recovery after the incident. You are right,your Father was a great and nobel Captain and yes, he was loved by all his crew and by his fellow sailors,like me.I am deeply saddened by his tragic loss. I met him a few times in Indonesia when he was in command of the ‘Rudolfo Mata’ at that time the biggest Livestock carrier in the world,later he relieved me in Fremantle,Australia on my last trip before retirement on the ‘Danny F 2’. Your Dad and I had some happy times together,he was great company and very humorous – a realy lovely Scotsman! Owen,I send you,your Mother and your wee Brother my heartfelt sympathy for your very grevious loss. but perhaps Arabic. It would be good to know what was said. Ahmad was one amazing officer and my Dad would go non stop speaking about him. He did even once say he thought of him like family. Him and my Dad were even trying to fly him over to Scotland to get him to see Scotlands amazing Scenery. i’m working onboard danny fII as 4th engr from August to February at Tusla, with C/E Wilson.And at the time of tragedy, my younger brother Benedick Cruz, was serving as a messman,until now he is one of six pilipino missing.And we are waiting for what news are coming for him from Lebanon. this his nephew that waiting for a news about my uncle benny for the sink ship Danny FII i wish until now my uncle is still alive even where you are give me un sign that you are still alive although the ship sink last december 17,2009 until now february 16,2010 there is no signs of life for him but i wish for the coast guard that keep searching for my uncle and rest of the missing crew thank you very much!!! I came across this excellent site and the details of the terrible tragedy. My family send their condolances to all the families of those gentlemen sadly lost. It was only last night when trying to contact John that I heard of his loss. John and I worked together for about 7 years in all sorts of places around the world and we became very great friends as he was such a dedicated man, probably the finest man I ever worked with either at sea or ashore. I will miss his phone calls, usually in the middle of the night from various places around the Globe. hope that they also have their loved one returned to them. the missing crew. We all want to know details of the investigation so we can be certain that lessons will be learned. I would like to remind all of you that have lost or are missing your loved ones, that you are still very much in our thought and prayers, we think of these men everyday and the poor people who are grieving for them. This is such a difficult time, we have all travled through many stages of grief and will continue to do so for a long time. It would be good if we had a list of names on these blogs as Martin suggested so we could remember each sole that didnt make it home. i would just like to extend my deepest gratitude to everyone who expressed their condolences to us and to the other families who were also devastated by this tragedy. i am the son of 2nd engineer manuel calaor, one of the casualties of the danny F II tragedy. the authorities have found his body on the eve of christmas. it was a very painful christmas for us but we are slowly recovering from it. TO MR. WILLIE GOODALL, i couldn’t find the right words to say how thankful i am for saying very nice things to my dad. i know dad treated you also as his very close companion. thank you for calling and condoling us when the incident took place. to my dad, though you are not physically here with us, i still feel you and will always be here inside my heart. I am saddened by the news of Danny FII, for the time working in the company Ia, it feels like part of my family. A hug to all those who suffered the loss of a loved one. i am willims from israel.there are 8 pakistani crew recived in israel. Hi .Owen Milloy,,, The disaster with the Danny FII is a great tragedy .You are right,your Father was a great and nobel Captain and yes, he was loved by all his crew and by his fellow sailors,like me.I am deeply saddened by his tragic loss. Owen,I send you,your Mother and your Brother james my heartfelt sympathy for your very grevious loss.i thought u remember me. My name is Ayoub Ghafoor I work in Saudi Arabia.I’m so upset about this tragedy, my brother Fazal Ghafoor a Pakstani crew memeber was on that ship, it’s about a year since the tragedy happens I can’t get any news about him, I don’t know if he still alive or dead, so please if anybody knows any thing about him please contact me via this email ayoubgfoor@live.com. I have just stumbled upon this site and don’t quite know how to express what I feel. I did my first voyage on her in the mid 90’s and loved working with such a diverse and comitted crew. I have many fond memories of this time. I did not know this Captain pesonally but my sympathy goes out to his family along with all the families of all crew that were lost. To hear that Gary was lost brings a tear to my eye. He was a true gentleman and fantastic to work with – even if he was always hitting his head on things! To George, Neil, Peter, Jim and Chopper – I hope you are all well. I am living in Melbourne with a 5 yo girl and 3 yo boy now. How my life has changed! Hi Amber,So nice to hear of your current situation, being mum to two little ones. I am sure you were as shocked as we all were to learn of the Danny’s tragic sinking, worst of all, the loss of so many good men we knew so well. It seems hard to believe to this day, there are still reports that indicate it is impossible to confirm that some of those missing are still not able to be confirmed as such.I often think of you & our sailing days, with fond memories. all who perished. For their families and friends the loss is very great and hard to accept. deaths are a tragic waste of life. so that we can know the full details of what happened. I offer my condolences to everyone else affected by the disaster. I also like Martin feel it appropiate to remember all who were lost at sea and their families, this date in time will be forever etched in my memory. my father is missing on dannyfii ship.one year ago but no meet my father is dead or live. HOLA , YO SOY NICOLAS ACHARD UN SOBREVIVIENTE URUGUAYO DEL NAUFRAGIO . HACE UN AÑO DEL ACCIDENTE . GRACIAS A DIOS ESTOY VIVO Y LO PUEDO CONTAR . PERO PERDI MUCHOS AMIGOS ESE DIA Y HOY LOS RECUERDO . LES MANDO MIS CONDOLENCIAS A TODAS LAS FAMILIAS . UNA ORACION POR TODOS ELLOS . HELLO, I AM NICOLAS ACHARD from URUGUAY, a survivor of the disaster from A YEAR AGO. THANK GOD I AM ALIVE AND I CAN COUNT. BUT THAT DAY I LOST MANY FRIENDS AND REMEMBER THEM TODAY. I send my condolences to all families. A PRAYER FOR ALL OF THEM. Only just found this website, whilst doing a search for photos of the Danny F (No 1). I served as 3rd and 2nd Mate on the Danny F and Fernanda F and have many happy memories of both. I have been deeply upset by everything I’ve read. The post by Samer was particularly sad – full of excitement and expectation, then 5 weeks later………I’m lost for words. Deepest sympathies to all who lost loved ones. What wonderfull memories we all have. To be cherished. No Lindsay was not on the Danny FII. The Chief Officer was Russian and was one of the survivors. We all eagerly await the Panamanian investigation report. My Name is John Bucknall, I was the captain of his private yacht, the “Alma F”. The 19 mtr Benetti was named after his niece Alma. Her brother is Danny there was another brother Armado. I served on the Alma F for four years, taking it from his Bucklers Hard residence Mallards to the Mediterranean for the summer. The yacht spent every winter in Bucklers Hard on the Beaulieu River. My wife who was the cook on the yacht spent the winters entertaining Mr Fares’ guests at Mallards. While in his employ I knew of all the ship conversions to Livestock carriers. We have many pleasant memories of our times. i am Dr.Jonson willims from israel.i requst to I.T.F.please save the poor 8 pakistani crew in israel. Dear.kevin matthews ya here 8 pakistani crew.arm of the Israel Defense Forces, operating primarily in the Mediterranean Sea theater as well as the Gulf haifa and the Red Sea theater. The current commander in chief of the Israeli Navy is Aluf Eli Marom.israel don,t want to show any news and media.i requst to all world please save pakistani crew. thanks. This is AFARIN KHAN from Pakistan , Father of SARDAR IQBAL , who has been missing since December 17th,2010 from Danny F2 Ship. I got this news from the internet that you are trying to contact Relatives of that Missing person. I request your honor to please let me know if my son SARDAR IQBAL is there in Israel or not. Please let us know . i will be waiting for your reply. you can contact me via this email ( sirajkswat@gmail.com )or on my mobile phone Number i.e +92-343-8990334. or let me have your phone number so that i can contact you instantly. If you haven’t finished you book I might have some memories for you. hi miles tallentire how r u. frind my father are still missing in this ship i have no meet full inforation. I just found the site and the pictures bring me many memories. I remember Chief Engineer John Lathan, who was mentioned in a comment of this page and I think that the captain was W.Deasy. Also of my times in Rachid Fares Enterprises as Head Stockman (1976 / 1983) i remember many who sailed with me on other ships of the same company as the Scottish Lindasy Milne at that time 3erd mate, the australian John Edwards from Fremantle with who did a trip on the mv Persia and good many others. My deep regret at what happened to the mv Dani F II. what what and what where the 16 pakistani crew.where find.where we meet the justice.plz plz. ther missing crew child waiting his fathers.plz help the poor pakistani crew-he was humen. Khalil Ur Rahman First Aid Trainer Pakistan Red Crescent Society Swat Branch. anybody have a photo of Al Fares, the small cattle carrier ex Chile boat? I have photos of the Al Fares, but am away from home for another month or so. OK! Thanks Mr. Neil FanecoI’ll wait. The 16 missing crew full report meet soon.i contcet the israel. To Gary, John, All the other great friends and the Danny F11 herself, RIP Forever in our hearts. Let the Beer and Rum flow freely. The past 2 years have been a treacherous journey for the families who lost their loved ones, the pain does not subside and we still cannot fathom how such a massive tragedy could occur. To those who never found their loved ones….I pray you have somehow found peace and please know that you have always been in my thoughts and prayers. To those responsible for the investigation report and finding much needed answers for the grieving….how do you sleep at night? no improvements in safety for other seafarers. petitioning to persuade Panama to release the report that they are duty bound to produce. It is difficult to believe so many seamen died and no one in authority seems interested…..the company should be ashamed of themselves! Is it not about time that some of the survivors tell bereaved families what happened that day? 2 years have passed and we are no further ahead. Our lives have changed forever, the pain caused by the loss of John and those who did not survive will never go away. Hi Everyone, today December 17 to two years of the accident, the Uruguayan survivors, we are gathered, fulfilling the promise that this time we were going to gather, to remember all our friends who did not survive, and know that always will be present in our hearts. To all family, we send a big hug. Nicolas, Ruben, William and John Paul. I’m a British author working on a book about merchant seafaring. Firstly, my condolences to all of you who lost family members in the sinking. I wrote briefly about the Danny FII for the UK’s Sunday Telegraph magazine last year (http://www.telegraph.co.uk/news/worldnews/8273847/Sea-no-evil-the-life-of-a-modern-sailor.html) and would like to write about it in my book. I’d be interested to talk to any of you about the incident, if you are willing. My email is rose@rosegeorge.com. I am the first Filipino Chief Engineer of Danny F2, So sad to hear this ship went down together with my Friends and also Capt. Milloy, God bless their soul. CE Peter Wilson if your around you can contact me: sdondiego@gmail.com. currently I am a Hull and Machinery supervisor on Newbuilding vessel assigned in Jing Ling Shipyard. Hopefully your new vessel is just around were I could come and see you, I miss you my friend. There have meet the missing crew report very soon. i am capt. suliman ahamd from leabnon the comments posted by stupid beast jonson willium that there are 8 pakistani seafarer under isreal navy custady is totally fake and there is no approachable reality in it,i appeal to all pakistani deceaese families that please for GOD sake don’t take it serious and pray for your missing loved on,i again offer humble requst to willium if your comments are true and you have some solid proof,evidence give me your contact no,mailing address through the same i have the sources to carry them from isreal,if you have no proofs please don’t post such kind of comments. that increase the tension of these deceased families. Dear suliman ahmad.i ali from pakistan.the missing crew familier are going so bad stuation.the families are so worid.if the there the leabnon rescue opration for time there no crew death and no missing.the are bid mistake the leabnon rescue the crew 10 hours in the water and the leabnon and syria watching the move wy? This so badluck this ship sink in leabnon.there have no meet the full report of sink ship.no meet death crtificte and no meet full inshurance money.the missing crew small children witing father.my brother make mad he told me every time when coming my father.i am also seaman i am also waiting becuse there have no meet any information. let me know if u have the detail then why u don’t help them?.if you are serious in this matter give me the complete detail about these missing pakistani seafarers.i will release them withen 20 days. i want to know the identity of these 8 persons,please send me the photos as soon as passible i promise that the matter must be confidintional between us . No photos about Al Fares yet?? clearance from diplomats before it can be released. I have also been in touch with Panama; their investigator has been avoiding answering questions for the last 6 weeks, but I have been told by someone at BIMCO, as Martin says, that a report has been done. I am trying to get a copy. Hello Amber,just saw your name,happy memories of working and sailing with you – gladdens an old mans heart – hope you havent lost your sense of humour! Pleased to hear you are doing well, Loretta & I often think of you & the better times in the past. The best thing about working for Fares was getting to know people like you and Loretta.Very happy memories! P.S. Were you aware that Nigel Pearson died a few weeks ago ? Thank’s for the kind words, we frequently speak & think of you with fond memories.Had not heard of the sad passing of Nigel.Where do you reside these days? Lebanon as Shore State which has delayed things. rechard thomus i rqust to you give uctice to us.if here we have no meet juctice to after death there big court of God.his time we are clean hands we are come to the world clean hands and we are goning to the world clean hands.there have big chance please give to us full information because the missing families are so bad situation.i hope you give to us the missing crew full information.there have come to chrismas.we want to full information we are mad we are sleepy.. I am ali from pakistan.my father are sitll missing since 17 dec 2009.today complet 3 years.but there have no meet the full information.i love you pa pa were are you come back we are so sleepy but but there are no meet your full infomation.how his your 15 frinds pa pa this world blind for you and your 15 missing frinds. 3 years ago I was on Board of one of the ships which where at scene a few hours after the sunk of the Danny F II. We saved the live of 14 remembers and recovered the bodies of 6 sailors and brought they all to Tripoli LEB and handed they over to the Lebanese red cross. For me it is unbelievable that after 3 year some families are still in doubt about their beloved ones. Me and my comrads created a memorial plate for all the sailors of the Danny F II who lost their lives and installed it in the Memorial Hall of the Monument for seafarers in Laboe Germany. My thoughts are with the Families! It has been a long, sad 3years. The lack of interest from the shipping company and maritime authorities has been disheartening. My family would like to thank the sailors who have had a memorial plate installed in Laboe, Germany – this means so much to us…….thank you…..it has lifted our hearts on this sad day! My thoughts are with the families of those involved in this tragedy. I’ve found a article in the Assafina magazin issue no.5 from 2010 about the tragedy of Danny F II. It is in arabic but I think here we have some members with arabic language skills. I do not comment, but after reading through a ton of comments on this page Rachid Fares Enterprises � WWW. Is there any further update from the FCO regarding when this report will be published? Ukraine’s ambassador to Israel and its military attache thanked Israel this week for the December 12th rescue of sailors from a merchant ship that sank off the coast of Lebanon. Well, the Israel National News website got it wrong. The ship went down on December 17th and not on the 12th. Don’t worry, its not the first time the INN errs. February last year, they had an article on Lebanon’s former president, Emile Lahore. Danny F II: The crew was rescued by UNFIl, Lebanese and UK forces, and apparently, Israel. pursue matters with Panama Maritime Authority. we don,t understand.when come new Information of the killer ship mv fraud 2.i thinking about mv dannyfii.i will send a latter of germany rescue team.they are told me we are save many crew in the ship.but we are asked to the save crew.but they dont understand english.he told me i dont understand where the missing crew. In loving memory of my brother Captain John Milloy. Remembering also all others who lost their lives 4 years ago today…..always in our thoughts. The wonderful memories accrued over the years of sailing with them can not be taken away. Marine Casualties and Incidents. However there is a brief analysis report that can be read. Five year ago but our lovers we are miss.i am don’t understand where 16 missing crew.? Hi Ali. It’s been a difficult 5 years. We will never know what truly happened that day. Much love to you and all families who have lost a loved one in this terrible tragedy. Subject : application for the job in place of cousin’s job. i have done five ships and i have two years experience at the rank oiler. let me mention you about my cousin who used to work at the rank of SSII (stockman) in your company ship. the ship’s name was ship cattle “DANNY F-II” unfortunately the ship capsized and sank off owing to stormy sea near lebanon on 17th december 2009. he died due to ship accident. his name was SAJJAD ALI and his father name is ABDUL MUTALIB. he was the only son of his father and now his father is too old to work for him and his wife’s livelihood. now there is no one in his home for working. therefore i kindly request you to get me a job in your company ship with his consent and i am the only person for him and his wife’s to support. i will be thankful for this favour. I’m very sorry for your situation and I feel for your loss but this is not a job-searching site, nor is this affiliated to Richard Fares Enterprises at any way. I”m afraid that posting here isn’t going to help you get a job so I’d advice you to contact Richard Fares Enterprises directly, or via any other way. sir could you please tell me email or website actually i do not know how to contact with relevant company so that i may be able to contact. Neither do I but Google will find everything, if it exists. Otherwise try the various crewing agencies in your & other countries, I’m sure they are able to find you a job. For your information Rachid Fares Enterprises no longer exists. The Danny F11 was taken over by another company many years ago and this company no longer exists. The M.V. Nada is owned by yet another company and if you are looking for work you must apply to your employment agency in Karachi. i am sorry for this i think we are in the same boat. ali, can you tell where are you from in pakistan? you said to me that “The M.V. Nada is owned by yet another company” can you tell me email or website of this company. so that i may be able to send my CV to that company. i will be thankful to you. You must go through Mc Kinnons in Pakistan if they still exist. Sorry I can’t help you further. our issues about the job is same. and we both are in search of a job. there is just left a flash of hope for us. and we have been waiting for someone’s help for a long time. Dear Rechard. I want your email address. Can you give me your email address. My email address shipsunkdannyfii@yahoo.com. Hallo dear sir.i want to you your email address. PLZ give me your email.i want contact with you thx. Sad to learn the sinking of danny f ll , condolence to the family of all the sailors who died in this tragedy. I am Angelito J.Felizardo one of the filipino 2nd engineer of danny f ll, regards to: capt barry, capt. philips, capt.thomas, c/m lindsay, c/e peter coleman wilson, c/e jhun bhagat, sorry not to mention the ohers coz i forget thier names. godbless us all. The government informed the upper house of parliament on Tuesday that it has made indirect diplomatic contacts with Israel to find out the whereabouts of 16 Pakistanis who are reportedly languishing in Israeli prisons. Responding to a calling attention notice of Awami National Party Senator Shahi Syed, Prime Minister’s Adviser on National Security and Foreign Affairs Sartaj Aziz said the Pakistanis had gone missing in 2009 when a merchant vessel, MV Danny FII carrying 83 passengers and crew, capsized in the Red Sea. Aziz said the government was utilising indirect ways through the embassies of the United States and Jordan to verify the reported presence of these Pakistani nationals in Israeli jails and was trying to ensure their release. “It is a serious human rights issue,” he said, adding that Islamabad was making efforts through indirect sources as it has no diplomatic relations with Tel Aviv. However, he said it has not yet been confirmed that these missing Pakistanis were in Israel. “Israeli authorities have not yet responded [to Pakistan’s queries] over the issue,” he added. Published in The Express Tribune, May 20th, 2015. Such a sad time for families who lost a loved one. In my opinion we will never know what truly happened that day but I do know those who died will always remain in our hearts and never be forgotten by the people who love them. My thoughts as always are with the families involved. Sorry , I forgot to mention also my c/o mark rickbay in danny f 11,how r u sir? Hello Jerry, I remember the day you left the Danny F2 at the Pan United Shipyard, 12 years ago… Hard to believe. I hope your injuries have healed completely? You are right with your comment above that there was a ‘love’ (additionally a respect & and understanding in my opinion) between all of the nationalities that worked onboard, irrespective of rank and/or position held onboard. The fact that so many of us kept coming back to the Danny F2 contact after contract, year after year in my view, speaks volumes….. I will not pretend that I can understand the loss, sadness and emotions of the immediate families of those lost on the Danny F2, but so many of us have lost good friends too. My line of work nowadays has me inspecting vessels and offshore rigs. On many an occasion I am required to attend the old Pan United Shipyard and on each occasion I always make a point of looking over at the floating dry dock that we occupied for so many months on the Danny F2 and reflect on the happier times we had there. Jerry, I wish you and your family all the best. My thoughts and best wishes go to the families and the shipmates involved with the Danny F2. I must dig out some pictures of these ships and crew. My thoughts are with all the Families of those exceptional Shipmates who perished that terrible day seven years ago. Difficult to believe it’s been 8 years. So many lives changed forever. 17th December 2012). My Mum would very much like to see this plaque. Thank you so much for sending the pictures of the memorial plate which means so much to us. It is comforting to know people care and that those who died will be remembered. I am sure it was a horrific experience for those who took part in the rescue and want you to know we are forever grateful. Again another year is over and the victims of this tragedy are still unforgotten and I send the best wishes for the relatives. So loved, so missed and very dear. Love to all affected by this tragedy and always grateful to the people involved with the rescue attempt. Another year flies in and we mourn the passing of Captain John Milloy and the crew on the Danny F2 who never survived that terrible night. I will raise a few ciders to Captain John Milloy who was a very good friend of mine since we were 5 year olds starting school together (1964), right through secondary school and met up and kept in touch right up until this tragedy happened.